Swagelok Company is a privately held developer and provider of fluid system products, assemblies, training, and services for the oil and gas, chemical and petrochemical, semiconductor, transportation, and power industries. 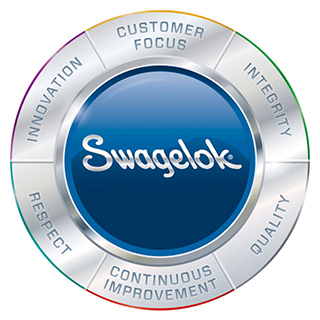 Headquartered in Ohio, Swagelok earns approximately $2 billion in annual revenues and serves customers through more than 200 sales and service centers in 70 countries, supported by the expertise of more than 5,500 corporate associates at 20 manufacturing facilities and five global technology centers. The Swagelok brand and name have long been synonymous with exceptional quality and reliability. Millions of our products are in use around the world. Our expertise in materials science, product design and fluid system performance-combined with an extensive global sales and service network-enables us to be a resource that our customers rely on for experience, insight, and support. We are committed to fostering a corporate culture that promotes our core values of innovation, continuous improvement, respect, quality, customer focus, and integrity. Our sustainability mission is straightforward. We actively work to minimize our impact on the environment. Each year at our facilities we recycle more than 15 million pounds of alloys and divert more than 50 percent of general waste from landfills. Plus, the products we develop and the services we offer enable our customers to reach their own sustainability goals. ERC Names Swagelok a 2017 NorthCoast 99 Winner! The Employee Research Council (ERC) has named Swagelok one of the top 99 workplaces in Northeast Ohio—seven times! NorthCoast 99 recognizes organizations that attract and retain top-performing associates who drive organizational results. Associates thrive in a culture that embraces lifelong learning, collaboration, and problem solving. Associates own shares in the company and benefit from the company’s success. Associates are guardians of safety; some Swagelok facilities have gone an entire decade without a single safety incident. Associates are committed to “zero customer disappointments” and strive to deliver the perfect experience consistently with total peace of mind—the right product and service for the right application that’s delivered on time and works flawlessly. Associates challenge each other to come up with new and better approaches and work together to provide the best products, solutions, and results for customers. Swagelok harnesses the full potential of associates by supporting a culture of lifelong learning and development. We offer access to classroom, online, and on-the-job training courses; experiential learning opportunities; and tuition reimbursement. Talk to supervisors, and ask them how they developed in their careers. Take feedback seriously; realize what you can do and how you can change for the better. Be resilient; don’t get discouraged. You own your development. Keep lines of communication open, and let your supervisor know what you are interested in pursuing, even if it is outside of your current department. Be open to opportunities on an off-shift or at a different facility, if your family obligations allow you to do so. Take advantage of training classes. Be willing to listen to associates who have more experience.